The Moray property market is shaping up well ahead of the prime summer selling months having witnessed a healthy start to the year. The firm has published its latest statistics for the first quarter of 2018 (Jan March), which saw a 10% increase in the number of properties available to sell through Galbraith in Elgin and 39% more market appraisals being carried out, in comparison to the last quarter of 2017. The team in Elgin also conducted 22% more viewings over the same period and had a 71% increase in the number of prospective property buyers registering with them. The Moray property market continues to attract buyers from the rest of the UK who acknowledge the affordability and lifestyle on offer in the area. 60% of buyers this quarter were from the rest of the UK and the remaining 40% of buyers were Scottish. Price, location and condition are paramount for buyers. The market has been particularly strong for both rural and in-town properties in the 200,000 - 400,000 price bracket, where we continue to generate keen interest and achieve good sales. The market is quieter for properties valued nearer the top end of the market. Moray is a fantastic place to live for those keen on a more relaxed pace of life, perhaps for retirement or those with young families seeking a great lifestyle balance given the abundance of outdoor pursuits on your doorstep. 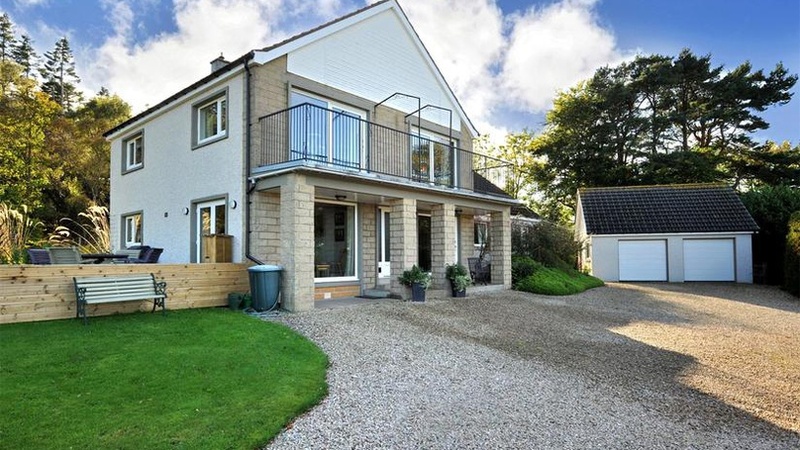 The areas that remain in high demand are the principle towns of Elgin, Forres and Lossiemouth as well as the Moray coast and Speyside which continue to attract second home buyers. This eight-bedroom property is an ideal family home and also offers superb potential to be run as a guest house which the current owners have successfully done over many years. Tanglewood Hoose is a most impressive detached five-bedroom house which has been renovated by the current owners to create a spacious and welcoming family home. The extensive grounds extending to about 1.4 acres with well-maintained gardens include areas of lawn, well stocked beds and herbaceous borders, a decked seating area, pond and patio.